As promised in my last post, I’m finally going to reveal my Kitchen Cabinet Makeover Annie Sloan Chalk Paint. I thought it was about time since it’s only been complete for at least 6 months now. But so much has transpired since then…it’s been tough to get around to writing about it. And YES, that is indeed a photo of my ACTUAL kitchen (see the stove? ;) ) from when we moved in–> and quite literally too, we had just moved in when I took that shot…please excuse the mess on the lovely gold counter tops there. I thought I’d give a little tease of what my kitchen looked like in the real before. And I promise, these are, in fact, the very same cabinets. I will tell you how we made them look different (better) besides just painting them in an upcoming, full on, reveal. Just wait until you see that. You will not believe the difference. I almost don’t and I lived it! I had originally painted those dark brown stained cabinets with a cream colored latex (from Lowe’s called “Milk Paint”) inside and out. I finished with a Ralph Lauren “tea stain” glaze (from Home Depot…they no longer sell it). I had the whole “Tuscan” theme going on. It looked fabulous and I got tons and tons of compliments on that makeover but after 9 years the glaze just looked “dingy” to me. 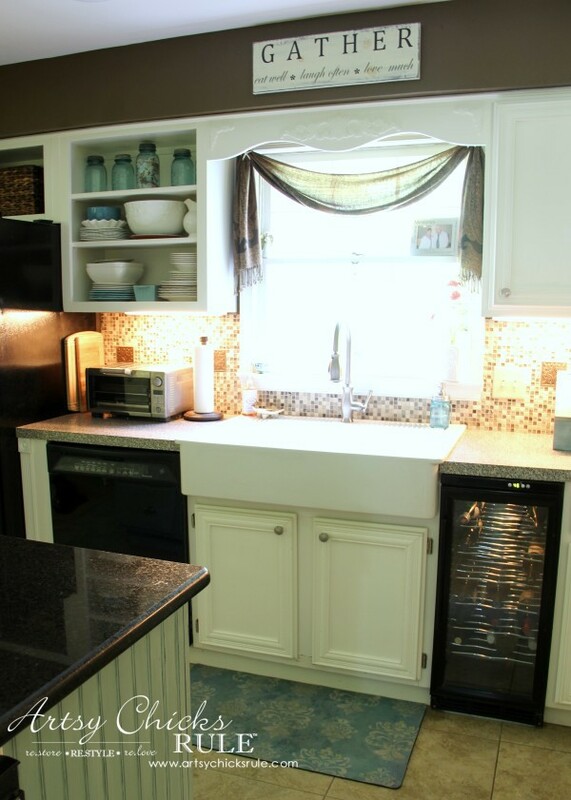 YUCK, time for a kitchen cabinet makeover with Annie Sloan Chalk Paint, don’t you think? They needed some work too….after 9 years of use. I cleaned them very well and then re-caulked the wood trim we added. And then I painted them with Annie Sloan Chalk Paint. I didn’t want them stark white so I mixed up some of these 2 colors –> Old White/Pure White. Since they are in the kitchen and will be handled a lot I decided to seal them with Varathane floor sealer (Lowe’s) instead of wax. The very same product we used when we refinished our wood floors last year. I also used it to seal my Kitchen Island that I painted in Duck Egg Blue Chalk Paint. You can see that project –> here. Yep. Painted them, sealed them, hung the doors all back up and was done. Yay! Looked at them for one week until I could stand it no longer. They were too yellow. Story of my life. Too much “Old White” in the mix and not enough of the “Pure White”. I knew it would drive me crazy so I removed all the doors, etc, and repainted them in a “whiter” blend immediately. 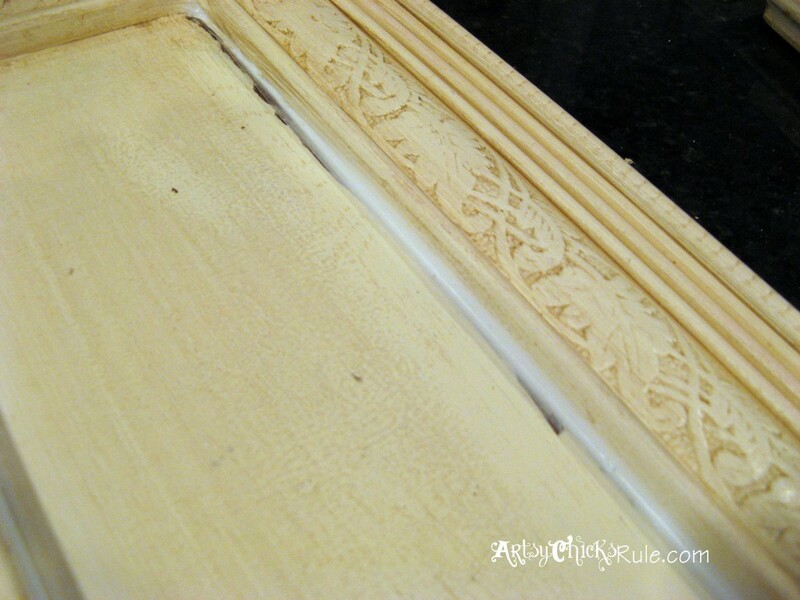 And that’s the great thing about Chalk Paint….no sanding, I just went right to it. And in this (terrible quality) cell phone picture. You can see the two finished doors. One is yellow-ish and one is more white. I know, don’t even say it…or think it. It’s a little crazy around here. 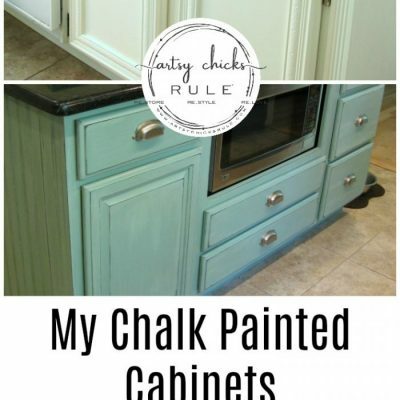 But just take look at my kitchen cabinet makeover with Annie Sloan Chalk Paint……. So crisp and bright (and clean!) looking. Yes. Like my little beverage (aka wine) cooler? That’s where the 1970’s trash compactor used to live. This one was made for that exact purpose, sized to fit a compactor space. But truly, what a dream it was to use the Chalk Paint. It was so easy. I painted them twice in less than 2 weeks, I should know. Note: I didn’t repaint the interiors because they were still in really good shape from the first painting. I didn’t “glaze” them so are a fairly good match to what I have now with the new paint job. I used approx. 3/4 to 1 quart can since I didn’t have to paint the insides. The knobs were bought 9 years ago when I painted the cabinets the first time. I ended up not putting them on back then but decided I wanted to add knobs this go round. I changed out the pulls on the drawers to these more “farmhouse” styled ones. We will be installing my farmhouse sink (<– look) we got from Ikea soon….and replacing our laminate “handiwork” there with beautiful dark wood counter top. Keep an eye out for that too! Can NOT wait. 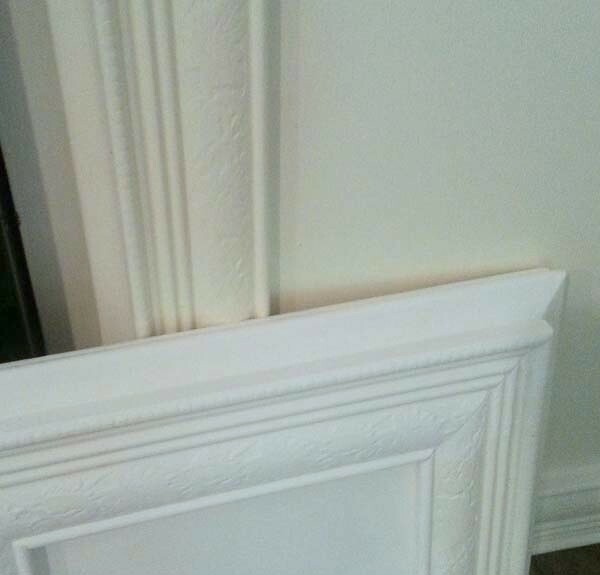 We also added a false wall to the ends of the cabinet to create the decorative edge you see there with the fluting, etc. These cabinets are 35 years old. We did a quick little kitchen cabinet makeover when we moved in 9 1/2 years ago thinking we would replace these at a later date. I honestly do not feel the need to at this point. We had to do a little more handiwork to get the refrigerator to fit into the cabinets when we moved in. We originally kept one side open (the door for that side no longer fit) and left one door in place. As you can see below, I also removed the doors on the cabinet above the fridge. My husband built the pullout to match the other end of the cabinet. (and to fill the gap between the fridge and dishwasher–there was a small cabinet there but had to be removed when we put the larger fridge in). I have officially painted just about everything in this house with Annie Sloan Chalk Paint at this point. 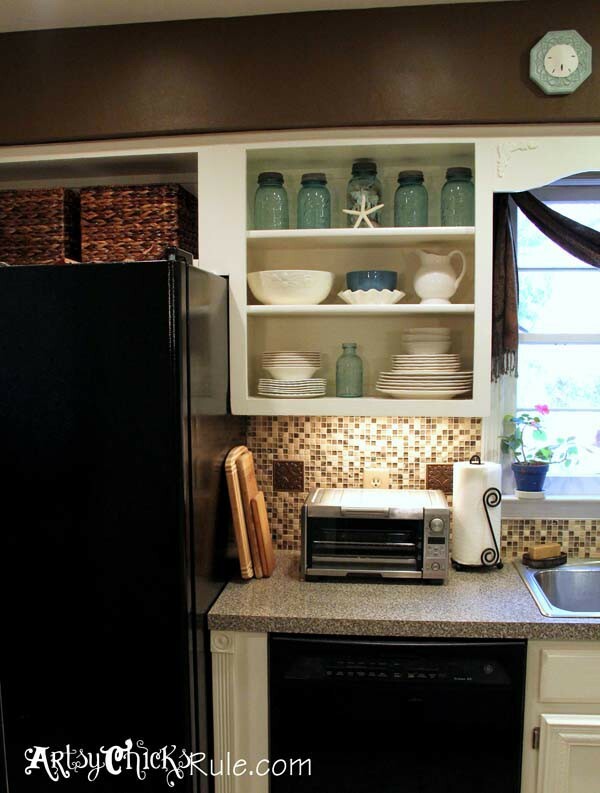 Want to see how this kitchen cabinet makeover has held up 4+ years later? And my thoughts on using Chalk Paint for this project? Click HERE to read my full update with photos. PIN it to save it for later!!! 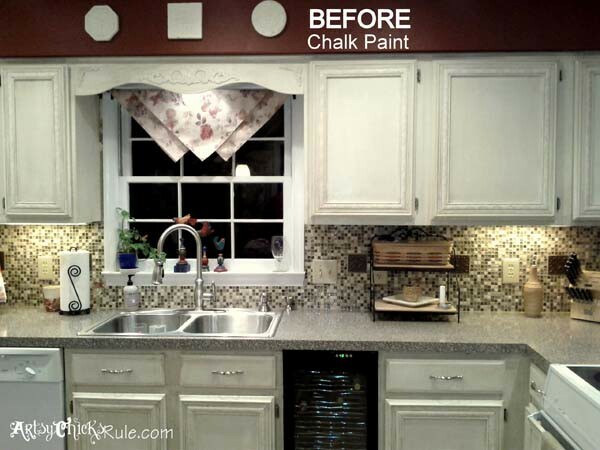 What do you think of this kitchen cabinet makeover (Annie Sloan Chalk paint)? Would you paint your kitchen cabinets with it? Stay tuned…lots more to come! Wow Nancy what a difference!! I LOVE the pure white, it looks so clean and brand new! You did a fantastic job! Absolutely beautiful! My taste exactly, right down to the blue mason jars! After so many changes and lots of hard work, you definitely got it right this time! Props to your hubby too! You are so talented. Beautiful job. Thanks so much Marlia! :) I am so happy with it! It feels totally different in there..and the whole house really, from how it was when we moved in. Long time coming but we are getting there! It looks beautiful. So much more brighter. How many cans did you use for your kitchen? Oh Nancy, Nancy, Nancy!!! Those cabinets look FABULOUS! I definitely agree with you on the whiter shade. Even though I am a huge fan of Old White, it can lean towards the yellow side sometimes. I can’t wait to see all the rest of your pictures! When you get that new sink, stove and counter tops, you’re going to have a picture perfect kitchen! BTW, I’ll be in touch soon k!! Wow- what an amazing job! You must be thrilled! Adding the trim is such a clever touch! They look beautiful friend! I have never even thought to use Annie Sloan on kitchen cabinets but what a great idea!!!! Your space looks completely different! You rocked it!!! Thank you Nicole! :) Yes, it was a dream to work with and really love how they turned out(not the renovations lol…that was not a dream…that was a nightmare at times! ha…but I’m SO glad we did it and it’s done!). 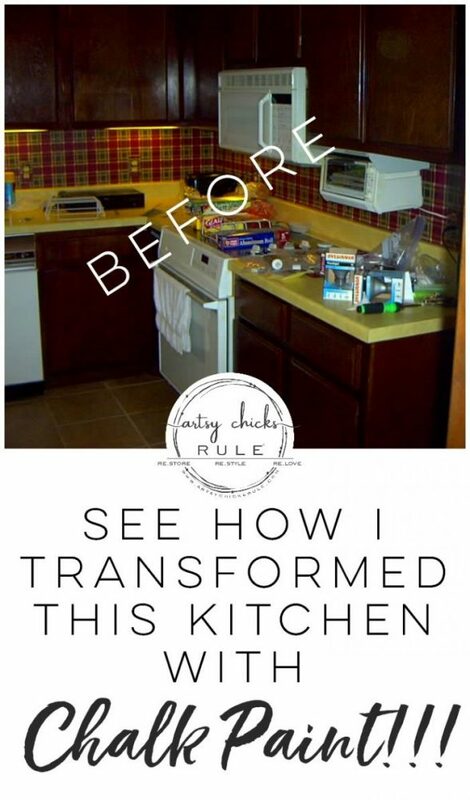 LOVE your kitchen make over! I bought some A/S paint and I love it too… So happy they have the white now..
How did you like the Varathane sealer on top? non yellowing, right (said crystal clear on can). I am looking for something to cover white paint on my kitchen cabinets so I was happy to see your make over. Thanks for sharing, will check to see how the new counters and farm sink go in your kitchen! Okay Nancy …you may have just talked me into redoing my kitchen cabinets ! I have a VERY small kitchen with just one run of maple cabinets. I hate Maple color ! The granite is new so that has to stay. so now I have to figure out the color ! It looks wonderful Nancy! What a difference some paint makes! Don’t you and I both know that Lorraine!! ;) Thank you! Perfection; if it ain’t broke don’t fix it, so keep those cabinets. They don’t make them like they used to and custom is over the top expensive. Very nice work. I am ready now to paint my drop front desk secretary I am using for a vanity in annie sloan. Awesome…Annie Sloan is the only way to go. I’ve tried several other brands and tested out recipes to make your own, but nothing compares. Yes, it’s more expensive, but Ms. Annie knows something the other ones don’t know! Looks gorgeous!! Your kitchen saga sounds like mine! I painted mine about 8 years ago and glazed them. They definitely were looking dingy to me. About 4 years ago, I repainted the entire kitchen. I used a mix of ASCP and Modern Masters Basic White. It was really easy to do. I used Modern masters Basic Black on the bottom cabs and my island. I have similar bin pulls on my drawers too! That is a great tip to use floor sealer on the cabs!! I HAND WAXED mine. And I have a lot of doors and drawers. I thought my shoulder was going to fall off. They have held up really well, but they definitely need to be waxed again. Ugh. Oh Karen, how funny, so similar!! Love it!! And no way was I waxing all of that, lol. I love this sealer. I’ve since used it on multiple other things. Good to hear that yours have held up well with wax…that was the one thing (besides the aching shoulder!) that I was worried about with kitchen use. Good to know!! 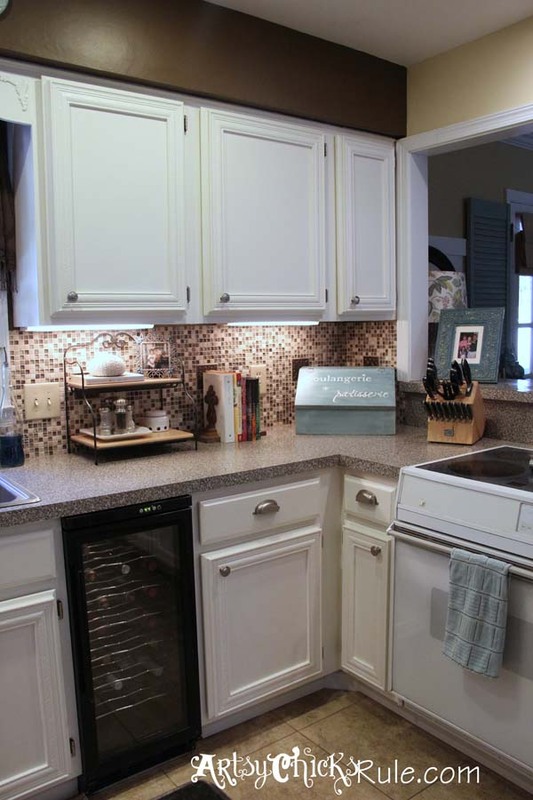 New to your site…Love your cabinets! Has the floor sealer caused any yellowing? Thanks so much! :) The water based (most anyway) are pretty good about not yellowing much. The oil based polys do yellow quite often though. The floor sealer I used is water based and really great. I have not noticed any yellowing at all. Would love to see a photo if you do decide to paint yours! Great job! They look gorgeous…I am about to paint my kitchen cabinets in the next day or so…using ASCP too…I am dreading the whole waxing thing…but after reading your blog I think I will try something else to seal them…did you have to redo the Varathane the second time around? Thanks Nancy! :) I have also used Minwax Polycrylic (in the aqua blue can) to seal quite a few pieces too. I love it and still use it on colored pieces. But that one can lean a bit on the yellow side like some oil based polys (not nearly as bad though…just a touch) on the lighter colors. I have not had that problem with the Varathane that I used so far. And yes, I cleaned them, painted them in Chalk Paint, applied the Varathane….and repeated all steps again to change the color (make them whiter). Not fun to have completed the job (to the point of putting the doors back on!) and wanting to redo them again. But it is done and thank goodness for Chalk Paint because it really made that so much easier than it would have been otherwise! My only problem is trying to decide what shade to paint my walls vs. which ASCP to paint the cabinets! Great information about the floor varnish on the cabinets & island; I will have to remember that when we get there. Fabulous as always! Positive thoughts for you and your family as you enter the holiday season without your mom. Oh yes, that is always a bit of a challenge. I just end up painting and then repainting (as you can see!) I just recently repainted my Study (very large room too) that I just REpainted last Spring. But I am in LOVE with the color I chose for in there. I will be revealing that at some point too. We are in the middle of building a built in bookcase with cabinets on the far wall right now. When it’s done…I’ll be posting about it! Oh yes, definitely check out the Varathane. Good stuff. Thank you so much..yes, it is heavy on the mind..especially so with the Holidays fast approaching. My parents 56th anniversary is on Sat as well. I appreciate your kind thoughts more than you know. We had a new kitchen put in 11 years ago, solid cherry cabinets with black appliances and brown granite looking formica — and hardwood floors…………………. everything is so B R O W N ! I have been talking about painting the cabinets for a while now – everyone says, NO don’t do it – you’ll ruin the cherry. I do agree but besides hiding a multitude of wear/tear with 6 kids – I really think a white kitchen would be beautiful and very cheery – not aladrab!! Looks great and very inspirational. Thank you Annette! Ha…no, I’m so sorry, Lowe’s does not carry the ASCP. Just private retailers do. I got everything else you see in the photo (wood, trip, counters, sealer for the paint, etc etc) from Lowe’s, for the most part. Sorry for the confusion. :) I was ordering online but have a local retailer now (but haven’t purchased there yet). You can check online to see if one is close by you at http://www.anniesloanunfolded.com/. Hopefully so, if not I have always purchased online through http://shop.robynstorydesigns.com/chalk-paint-decorative-paint/. They are WONDERFUL. You did a lovely job. Don’t you just love paint? BTW, how much ASCP did you need for this project? Love your pure white cabinets and all of it Nancy! You already know I’m crushing on your fabulous backsplash too! I finally found the tile I wanted to use for mine just this week! yay! Thanks for sharing all your awesome Annie Sloan projects and experience! I really enjoy hearing all about it. Fantastic job Nancy! I LURVE! Your paint job looks fabulous! I about died when I read that you had to reprint when the Old White looked too yellow. I can’t wait to see your other updates. LOL …. I know!! ;) It was bad before…anything is better!! Nancy, that is an amazing job. I’ve been in the middle of deciding which way to go. Paint or re-face. Thanks so much!! And yes, I totally agree with you. It is so expensive to have things done, especially so in the kitchen area. We’ve done everything in this house ourselves and have saved a ton doing it. For the repaint, I have to say, it was definitely much easier this go round than the first time I painted them after moving in. The Chalk Paint did make it easy! Your kitchen looks gorgeous Nancy- so refreshed and clean and bright!! I love it! We need to tackle our kitchen one of these days- thanks for all the hints and tips:) I love your open display cabinet- I hope to incorporate that somewhere as well!! Is the backsplash the DIY adhesive stickers you can get at Home Depot? I was considering this as an option and yours looks great! Hey Nancy..I love all your projects, and I to am getting ready to paint bathroom and kitchen..my question is do I have to prime the cabinets before using chalk paint? Hi Nancy – stunning transformation with paint and added touches! It can be such an instant uplift to modernize and clean up a space with fresh paint and a few ‘extras’ – thanks for the inspiration! Thank you! You are so right. After you painted the cabinets the second time did you seal them again with the same product you did the first go round? I have been wanting to paint my cabinets in the chalk paint but wondered how well it would hold up. With 3 kids ours get a lot of use out them. How long ago did you do them and have they held up well? No chipping or scratches? Stuff like that. Thanks for a response. They look great!! Makes me want to start mine tomorrow!! thank you…and good luck with yours!! how do you apply the floor sealer? Also, I think the application of the Varathane as a finish really helped to make them look more “smooth” as well. Can’t wait to see yours!! I am sure they will be beautiful! Nancy I did mine too with ASCP and Poly… Mine have been done for almost a year now. They couldn’t clean up better! Even scrubbing them is fine…. Best move we ever made. 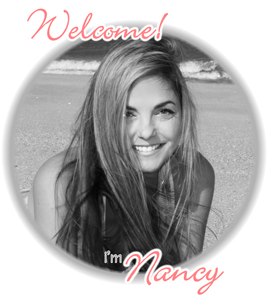 Hi Nancy, I feel so blessed to have come across your page this morning. My kitchen cabinets are like yours were in the beginning. I have lived in my farm home for fourteen years and have changed a lot of house except for the cabinets. 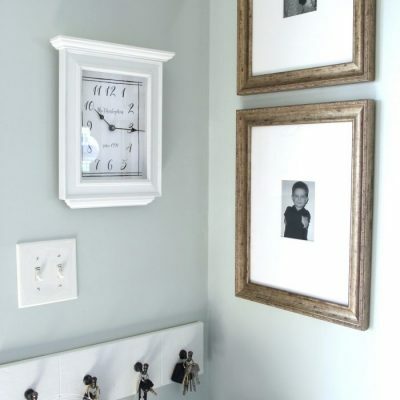 The picture frame trim: is it one or several joined together? I have never heard of the chalk paint that you used, BUT I can tell you I WILL be purchasing some. THANKS SO MUCH for showing us all your wonderful, beautiful projects. Fortunegirl. I think I will do a separate post on this. I’ve had so many people email with interest about the door facings. :) The trim is one piece (cut to fit the door fronts). It really made a huge difference in the cabinets!! Your kitchen is absolutely stunning! I’m so glad I came across this on Pintrest I’m in the process of furnishing my home office and I want the same color desk as your cabinets. I found a really great desk on Craigslist that has the same structure as the Bedford Pottery Barn desk for about 10% of the price. This will be my second “diy” project and my first time using Chalk paint. Did you do any distressing on these cabinets? Is that something that has to be done or can I skip that step? Thank you so much :) The kitchen cabinets didn’t get any distressing, no. I wanted them to have a nice, crisp, clean look so didn’t do it on those (I did on the Duck Egg colored island though). You can definitely skip that step if you don’t want the distressed look. I recently painted the cabinets in my house with chalk paint and finished with the soft wax. I am a little nervous though about not putting a different sealer over them so that water doesn’t affect them. Everyone I’ve talked to is worried about a polyurethane yellowing. What do you think? Don’t be nervous about water bothering them. The wax makes them pretty resistant to water. You could try applying another 2 coats of wax (I probably would do that anyway for kitchen use). Just wait about a week in between coats so it has a chance to fully cure. You really can’t put a sealer such as poly over top now because of the wax. You would have to sand the cabinets back down to remove the wax before you applied poly. And yes, regular oil based poly does have a tendency to yellow. The sealer I used (water based) doesn’t yellow like the oil based. I have not noticed any yellowing with my cabinets or other things I’ve used it on. Thanks!! I think I’ll do another coat or two of wax. It’s just so dang hard on the shoulder and arm! Lol. But they look great and I love them. I did equal parts of Old White and Graphite and distressed them. Love that your new kitchen is so unique! You can’t just go to any ol’ store and get this! I’m a huge fan of utilizing old with new, and you’ve done an amazing job doing just that. So my question.. My husband bought an old white dresser (ugly, but very solid construction with detailing) for our 7 year old daughters room. I want to paint it with chalk paint.. Can I paint over the existing semi glossy paint without sanding or primer? I wish I can put a picture up for you to see so I can get your artsy and creative advice! Wow, I love this and all the more so because it’s not one of those situations where the homeowner spent a zillion dollars and just put in all new everything; I mean, where’s the challenge in that, right? :) We have a 1978 house and redid the kitchen years ago but I loathe the wood cabinets still. I’ve painted several pieces of furniture with the ASCP and couldn’t love it more! I was worried about durability on kitchen cabinets, which si what’s held me back. Knowing you finished yours with Varathane and how well it works and looks has convinced me to give it a shot too. On the proportions, I don’t have exact measurements, sorry! What I can tell you is this…I added about 1/2 and 1/2 of Old White/Pure White last time and it was too yellow for me. When I turned around and repainted them I probably used 3/4 Pure to 1/4 Old White. Somewhere in that range. what a great transformation. Doesn’t the poly finish coat turn the paint color a little yellow? Did u have any old white mixed it, or just pure white? Yes, it was a mix of Old White/Pure White…but I’d say at least 3/4 Pure. Did you use the sealer over the last painting? Before painting again did you just paint over the sealer? How much paint did you use ? Did you do two coats over the brown? They look fantastic! No I just finished them with the glaze. (over the latex) When I painted them with CP, I just painted right over that previous finish. I don’t remember exactly how much paint I used because I mixed 2 together plus I painted them twice (with the CP..because the first go was too yellow!) But it really didn’t take too much! The latex over the brown was done about 10 years ago…but I am pretty sure I did 2 coats, yes. You did a beautiful job, how inspiring! I just watched the video you were on. We have white kitchen cupboards but they are awful laminate that is dried out on the edges. If you are careful you hit an edge with something; it chips. Have you had any experience painting laminate? Do you know what you would use to fix chipped laminate? We also have white tile on the wall. How do you like the look of painted tile? I have painted a few laminate pieces (they are not my favorite to paint..but the Chalk Paint did do well on them). Fixing chipped laminate…well, you could try wood putty but if the laminate is not adhered well past the chip that may not work so well. Sorry! Painted tile can be really cool…depends on what you do! I wouldn’t hesitate to paint it (especially with Chalk Paint and a poly or even wax coating to seal it) But try a small piece first to make sure you like it! I love your work I’m just getting ready to do my dinning room furniture and kitchen cabinets. Do you think I can use chalk paint on my China cabinets. And how would I add moulding to the cabinet doors. You can use the Chalk Paint on any of that wood…should be fine! And the molding, I am planning to do a post on that soon. But, I just cut, glued (wood glue) and clamped them well. 10 years and still going strong. I was planning to do my upper cabinets with a blend of Old White 2 cans and Pure White 1 can. I’m so glad I read your post, in which you suggest the reverse in order to avoid the “yellowish” look. Saved me a lot of disappointment and work. Cheers. 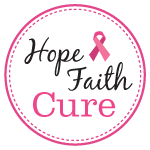 Hi Nancy, I came across your blog while doing my prep research before painting my cabinets with ASCP. Love your post, it’s very helpful! Can you tell me how many coats of Varathane you applied? The can says minimum of 3 coats and 2 hours of drying time between recoating. That will take forever! I’ve noticed that it dries fairly quickly, within an hour so I’ve been recoating without sanding after an hour or so. Do you think it would totally mess up my cabinets and make them chip in the long run? Did you wait 2hrs between coating and sanded as well? TIA! I only applied one coat of Varathane on the cabinets (I applied 6 coats to my floors when I refinished them! ;) ) Well, technically I did 2…since I finished them completely and then decided they were too yellow and painted them again, and resealed again. BUT one finish coat is all I did. You can do additional coats if you like though. I would follow the instructions fairly closely on the can as far as that goes. (time between application) I did with my floors. 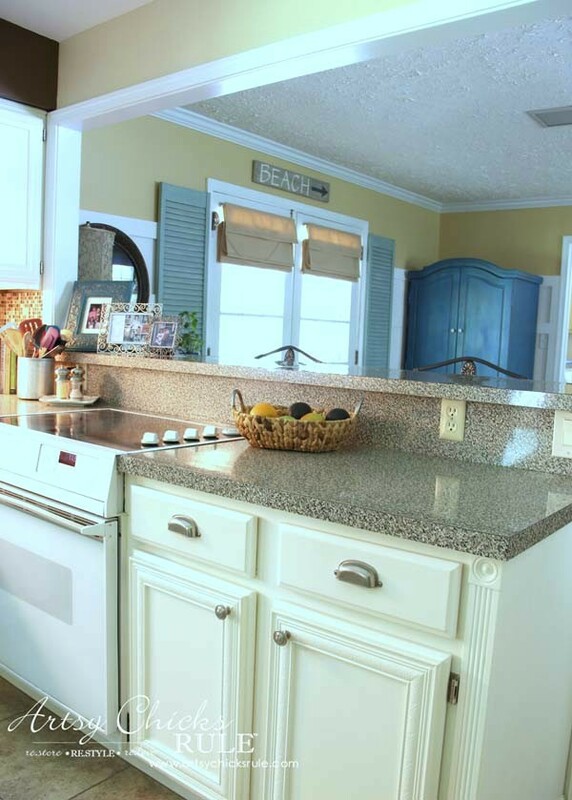 Just remember that those gold countertops were fashionable when they were installed! I just moved out of an old building where some of the apartments had the original kitchens from the 60s. THAT was funny to look at. How can somebody (really, lots of somebodies) not change the kitchen in 50 years….not even the appliances. I promise. Can you tell me your source for the pulls and knobs? They look very solid, almost like pewter. Exactly what I’m looking for. Thanks so much for sharing this! You did an amazing job! I have used ASCP on small pieces of furniture and LOVE it, so I am thrilled to know that it works so well on kitchen cabinets. About 10 years ago, I painted my light oak cabinets with a creamy tone oil enamel (ugh, wish I’d known about ASCP then). They’ve held up surprisingly well after all this time, but there is definitely some chipping (down to mostly bare wood). 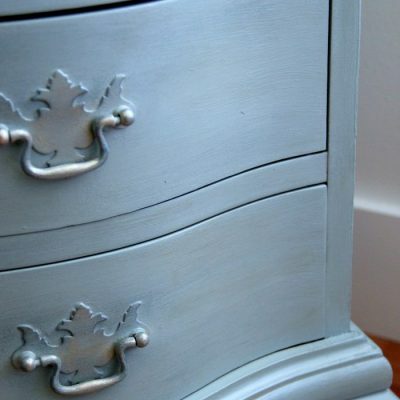 Will the chalk paint cover the chipped areas? Thanks so much! :) Yes, I love how well it’s done in the kitchen, on the island and the rest. For the chipped areas, I would just sand it down well so that it is smooth and paint! Should be fine! I love that people are still commenting after all this time! All your before picture needed was Alice standing at the stove making her famous meatloaf and Carol Brady unloading the groceries. The after picture however, will still look current for many, many years to come. You did such a great job! I’m glad you went with the floor varnish – makes life in the kitchen so much easier and no yearly maintenance. ASCP rocks! I just did two small, antique telephone tables in Old White with Johnson’s paste wax (it made it a bit darker but I didn’t mind). Planning on doing the double sink bathroom vanity next, followed by everything else that’s not nailed down. It’s an obsession – in a good way. Oh and yes, the Varathane is great stuff! Very happy with it. It is most definitely an obsession…but a totally fun one! Great job! This is a project I need to tackle one day, as my oak kitchen cabinets need a revival! Question for you–did you seal again with the sealer after painting them the second time? You said you did AS paint then Varathane sealer then they were not white enough so you repainted a whiter shade, so after the whiter shade did you reseal? Trying to take notes…thanks! Thanks so much! :) Yep, I sure did! Both times. Ten years ago I sanded them down, added wood trim fronts and painted with latex paint and added a glaze. Fast forward to this past year. I washed them well (no prep other than that), painted them with Chalk Paint, finished them with Varathane. They were too yellow. So I turned right around and repainted (no prep) with more Chalk Paint and finished again with the Varathane. Hi. Love this site and glad I found it! I have very dark 1970’s cupboards and wanting to go with the AS pure white. I came into a little trouble with the old stuff bleeding through. Fast forward a little I ended up using primer paint after 2 coats of AS pure white. because of the bleed thru. then after 1 coat of CP over that its what i was trying to acheive. now for sealing do i use clear wax? or ur recomended poly floor finish? i dont want them yellowing. I have a younger child and a dog to worry about scratches. how do you suggest applying the wax OR poly? and do you have to sand the poly off first if you want to repaint? Thanks for all your ideas and help! You can use Clear Wax, lots of people do. I use it on most of the ASCP pieces I do but for the kitchen I chose not to. I think scratches are possible with both end products, as with anything. BUT so far the Varathane as been super durable. I am so glad I went with it for the kitchen. I do love a nice wax finish though on other pieces. I applied the poly (one coat) with a good brush. Thin coat, not too thick, just enough to cover well. You’ll have to play around with that to get a feel for how much you need. No, you don’t have to sand off the poly to repaint. (you will have to sand some if you choose to paint latex over top, etc so the paint will adhere..but you won’t have to sand down past the wax, as you would if you choose to do the wax) If you paint over again with chalk paint, either over poly or wax, you don’t have to sand. I used floor varnish on my cabinets but it turned them yellow… any suggestions? I covered them again in paint, but I don’t think I can use the varnish again. Will it be okay without the varnish? Did you use an oil based varnish? If so, those do tend to yellow. If not, if it is water based, it too can take on a bit of a yellowish cast if applied too thickly. But typically does not yellow. 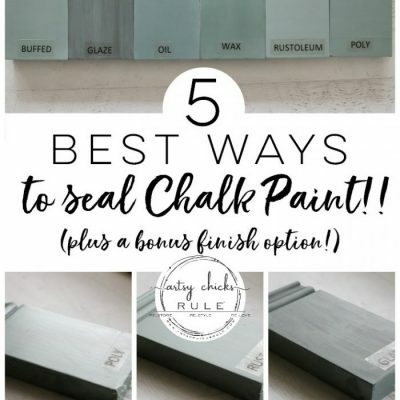 No, if you use Chalk Paint they will need to be sealed with something to protect the paint, either wax or poly of some sort. Oh thank you for the reply! It is water-based. Basically, I used an older water based varnish and it yellowed. So then I bought a new can and it only partially yellowed. But, maybe I put it on too thick. I’ll watch it for the next time. It is so hard b/c I felt like I didn’t put it on that thick at all! The trial and error continues. Thanks again!! When you put the Varathane over the white cabinets, did it change the color at all, yellow it any? And what is the best way to put that on? What kind of brush did you use for the chalk paint on the cabinets? Thanks!! So I loved your kitchen so much that after reading through it, I went straight to work and have now painted my cabinets. They look amazing, but now that I’m ready to use the varathane I am a little concerned. Im worried about yellowing and also wondering how many coats you ended up doing? Thank you!!! About the Varathane, I have had no yellowing with that product (apply thin even coat). I only used one finish coat and it’s held up great. New to all of this : ) Can the chalk paint be done over stained cabinets? Thanks for your quick reply! I have 2 young boys at home and a VERY clumsy husband. He’s a bull in a china shop! So know the chalk paint has held up is great. I have a very 80’s kitchen in light oak that I’ve lived with for 15 years because I was going to school and then having babies… Now I have a little (LITTLE) spare time and want to start tackling that ugly room. But I didn’t want it to take weeks and weeks. I am so excited to start this project and I’ll be using your blog as my guide! Thanks so much for sharing! I’ll let you know how it goes! okay totally off the topic but I’d love to know what hardware you went with? do you like your cup pulls or do they drive you crazy??? Nancy, you make this project sound so do-able. I’ve wanted new kitchen cabinets since mine are looking dated & yellow. They are maple with a light stain and, over the past 20 years, have gotten alot of exposure to Arizona sun thus causing the yellowing. Do you think that Varathane is still the way to go when finishing the cabinets? Also, what is the brand & color of your granite-looking laminate and has it been durable? My husband is trying to talk me into replacing our old laminate kitchen countertops with a faux granite laminate but won’t budge on getting new cabinets. I had never heard of chaulk paint before. Did it dry with a hard durable finish? It does once it is sealed…either with wax or poly. How much chalk paint did you use for your kitchen? I don’t recall exactly since I painted it twice within one week! ;) But I can tell you it was not a lot. It was somewhere around 3/4 to 1 can. But remember, I had previously painted the insides years ago and didn’t feel it was necessary to repaint those so it took less paint. I am doing some quick research on chalk paint and so glad I stumbled across your page! I was dreading using wax for my kitchen cabinets, but I am definitely going to try the Varathane! This is my first time painting with chalk paint (actually, my first time painting ANYTHING!) and would really appreciate some painting 101 tips. 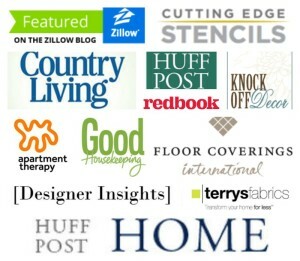 -Which paint brushes should I use for my oak kitchen cabinets? Do I get two brushes-one for the CP and another for the Varathane? -Do I dip the brush directly into the CP/Varathane containers? -How long do you normally wait between coats of CP and prior to applying Varathane? You can use the same brush for both but just be sure to wash it well. I would use a good brush (I like Purdy) for the Varathane. No, you should pour a small of the Varathane into another container to apply. The CP dries fairly quickly, once dry you can repaint. I would leave it overnight before applying the Varathane. I wish to second the recommendation to use a Purdy brush. They’re more expensive, but they’re worth it. My kitchen it painted with oil based paint and is entirely too white and shiny and it is chipping off. I’d love to do chalk paint like you have done. Your kitchen is gorgeous!!!! 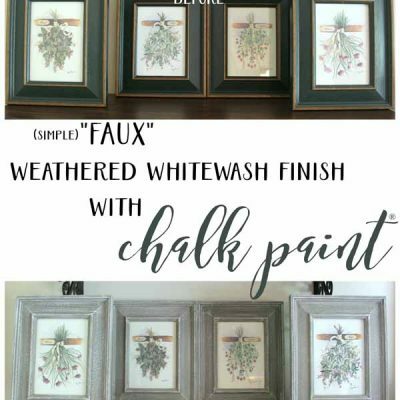 Can you paint over oil based paint with chalk paint? I know you can’t paint latex over oil without priming. 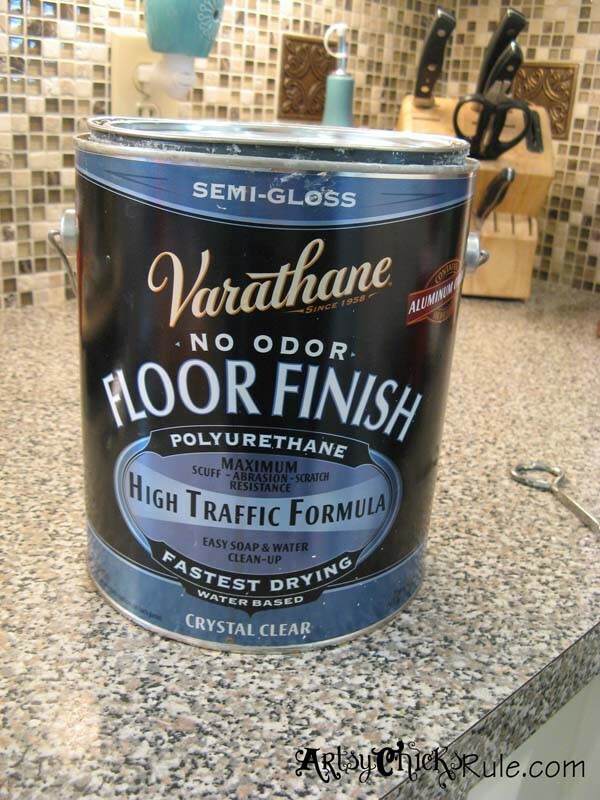 I am looking for the Varathane and the Floor Finish formula only comes in one gallon (I dont need this much). Do you think I would get the same results if I use regular Varathane Polyurethane Water-Based Heavy Use Formula? Do you recommend Satin, Semi Gloss, or Gloss finish for kitchen cabinets? Consider spar varathane (marine quality). It’s intended for wooden boats. What makes it marine quality is not that it’s hard, but that it doesn’t get brittle, which is an issue with the very hard curing varathanes. It flexes without breaking, which as you can image is very important for boats, but is also good for your cabinet doors and drawer fronts. I can’t say because I haven’t used that one. I usually like a satin finish on most pieces but had the semi-gloss (left over from our floors) and just used that. I’m glad I did, I think the semi gloss is the perfect finish for the kitchen. Sorry I can’t be more help on that other Varathane product! Great finished look, Nancy! Did you have a problem with wood grain showing through? I am wanting to paint our honey oak cabinets with chalk paint to avoid the sanding part, but heard that primer is what really helps with the wood grain. Any suggestions? I am considering doing EXACTLY what you did. 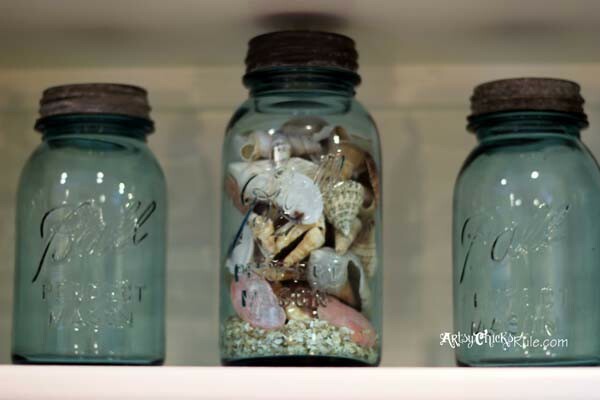 How many quarts did you need of the Annie Sloan paint to cover your kitchen? Thanks in advance for your advice….we are considering this job for our contractor next week on a new home purchase! So excited to have seen your post! Thank you. I used somewhere between 3/4 to 1 can. But remember, I didn’t have to paint the insides of the cabinets. They were painted with latex 10 years ago so I skipped repainting because they match ok and were in good shape. Yes, I’ve used it on my wood floor refinish and my kitchen cabinets and island. It’s held up like a rock! BUT I’ve never used it over latex paint, only Chalk Paint and bare wood. I only applied one coat on both the island and the rest of the cabinetry. (2 different posts, painted at 2 different times) I used 6 coats on my floors though! Just ran across your wonderful site! Kitchen looks awesome! 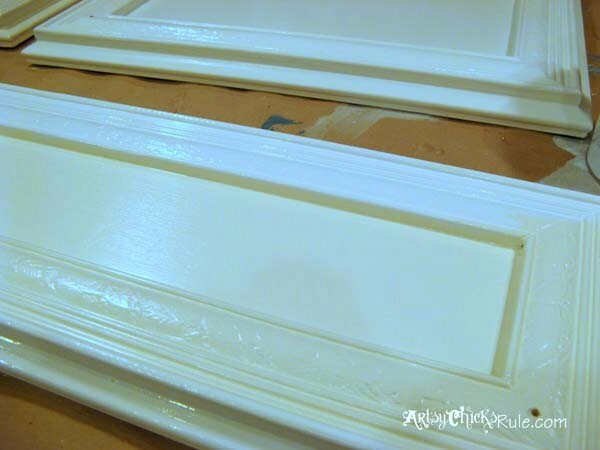 I do many furniture makeovers in chalk paint but have never used on kitchen cabinets. My concern, like yours, is the durability in the kitchen. I see that you used a coat of Varathane to seal the cabinets. I have never been good a applying polyurethane of any kind! Is this stuff easy to apply?? Is is self-leveling or will I have brush marks, bubbles?? Does it have a shine? I do not want it to shine! ;) Wish I could just wax like I do with my furniture but I know how grimy kitchen cabinets can become over time…and don’t think that the waxed, chalk finish would be too durable to scrubbing. We’ve just bought an old house (built in the ’70s) and the kitchen hasn’t had a thing done to it since! Including all the lovely appliances ;) We don’t have money in the budget right now for a kitchen reno, but the room needs something! You’ve totally inspired me to go the chalk paint route- but I have a couple questions. ~what did you use to clean the cabinets before you painted them? 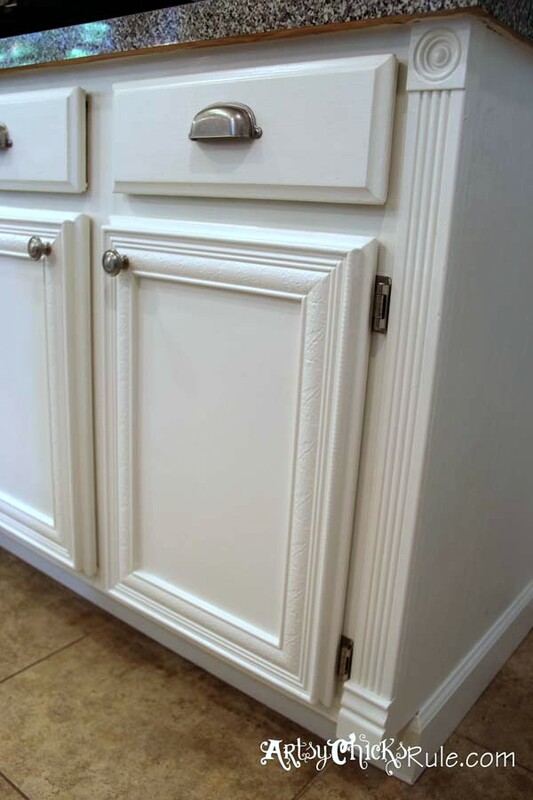 ~LOVE the trim you added to the cabinets to give them “something”- is it just like chair rail molding? ~do you just use a regular paint brush to apply, or does that show brush strokes? Hope you can answer some of these questions even though this is an old post! You have seriously turned my frown upside down seeing that I don’t have to be stuck in a nasty kitchen until we save the $20K to remodel it properly! Oh no, you are exactly where we were when we moved in! ;) We did a “quick fix” makeover and through the years have continued it. (removing walls, building an island, adding board and batten, new flooring, etc. BUT we never ended up replacing the cabinets like we had planned! Probably won’t. I plan to put a post out on exactly how we did the doors but haven’t gotten to it yet! Oh no, don’t be nervous. You can use a roller or a brush. (you can lightly sand over after to smooth out a bit before applying whatever sealer you choose) Things you probably already know since you work with ASCP already but thought I’d mention just in case. The Varathane floor finish has been great. So happy with it. It’s pretty tough stuff. I’ve used it on a few other pieces too…as well as my kitchen island that is also Chalk Painted in Duck Egg. It’s been about 1-1/2 years now and all is good with both. nancy– did you wax them also with AS wax and then use the floor sealer? Nope, I did not wax these at all. I used the Varathane in place of the wax as a sealer. As a matter of fact, the Varathane (or any other product like that) will not adhere to the wax so be sure not to try that! ;) You would just do either/or. Thank you for a quick reply! I’m in the middle of choosing a high dollar cabinet painter vs doing it myself and this looks very very doable. Mine are already painted a decent creme color and will keep them neutral, maybe a tad darker. I’m SO HAPPY that I won’t have to do the wax step (since I hear it takes alot of elbow grease and time). Thanks again, love the blog!! Hi! So, you only used half a can of paint for the first go around on your cabinets? I have to order online and I was going to order 4 can but I have just about as many, if not less, cabinets as you, so I would then be over doing it! Thanks!!! Hi, i absolutly love your kitchen, i just painted mine with ASCP white yesterday, and its time time for finish, when i started wax i run trough a problem, to me its hard to wax, i think its dificult to make it even its, do u think i can do same product (floor finish) on top of wax or i should remove wax complitly? Thank you! Oh yes, the wax can be hard to work with at first. As far as now using poly, you would have to remove the wax completely before applying it (it won’t adhere to the wax and you’d have a big mess). How much have you done? You can sand it off, repaint and then use the poly. Mine have held up great with the Varathane as a sealer. Couldn’t be more happy with it! Hi Nancy! I’m in a similar predicament! The blend of old/pure white is toooooooooo yellow! What did you do to get them brighter white.. Pure white? Or a variation on the blend? what type of painting utincils did you have to use for these cabinets? did you use a brush or roller? anything special? I am test painting one of my cabinets and its turning out a little weird looking when I use the roller and when I use the brush I get a lot of stroke marks? any tips? I used Purdy brushes. No rollers but you can use a roller if you like. That’s what I used the first time with the latex ten years ago. The roller tends to give it a slight bumpy appearance (in my experience) and brushing can give you brush strokes. Two things you can try….watering down the paint a bit makes it a little more “workable” and creates less strokes — light sanding after painting (after it is dry) to soften and remove any strokes. 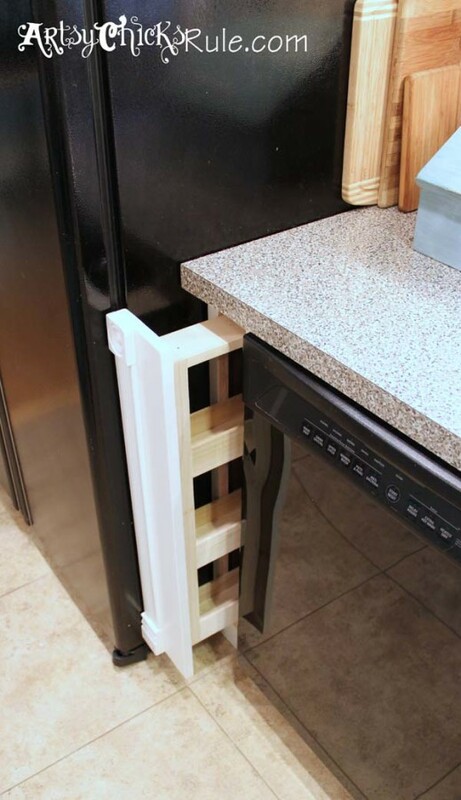 Really off topic here, but who makes the mini frig (AKA wine frig!) and do you still like it? We have a trash compactor that needs to GO! Great idea! And, your kitchen is beautiful. Thanks for all of the helpful tips! I was wondering if you have had any problems with the paint peeling? I’m debating whether to paint my cabinets or stain them. They are currently honey color oak cathedral style (upper and lower) cabinets that are in desperate need of an upgrade! No, I sure have not. If you are concerned and/or have a slick finish on the cabinets, you can do a very light sand (by hand) beforehand for extra adhesion. 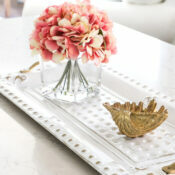 hi Nancy- I have been reading about your remodel in your kitchen and I love what you”ve done!! I am currently refinishing a canopy bed and want a more aged look, to achieve a French-country effect. I too am using a pure white/old white blend, but this far I have waxed because I want deeper detail with the Annie Sloan dark wax in the more textured areas. How would I go about achieving th hat effect of I wanted to seal with the varathene? I would seal with Varathane first, and then go back with a glaze and apply to the areas that you want the detail and wipe away excess. You would have to do the Varathane first to “seal” the Chalk Paint. Just be sure you don’t put Varathane (or any poly) over top of wax. It won’t adhere. Hi Nancy, Love your kitchen! I’m curious if you painted the inside of the cabinets as well or if they are the original finish (I’m guessing dark brown?). Any chance you can include a picture? I painted the insides the first time (10 years ago) with latex and it was a light cream color so didn’t feel the need to repaint this go round. :) They are holding up great and I really just wanted to brighten the fronts and doors, etc. They are actually very close in color because I did not “glaze” the insides the first time, just the outside areas. I took your advise and sealed my bed with Varathene( in satin finish), before using a stain to get an aged effect. But when I checked back on my project 2 hours after applying the first coat of Varathene, it was all crackled! I mean, it’s a nice affect, but not what I was going for. What happened? Did your cabinets do this too? I’m working indoors on this project, so I know it’s not a climate thing…help! I really want to refinish cabinets in my house as well, but I don’t want to have to wax them every year! Please tell me what I did wrong so I can stop listening to my husband complain about the $50 the varathene cost! I am guessing maybe the CP was applied thickly or wasn’t 100% dry before you applied the top coat. I am trying to decide what to do with my cabinets. I tried applying a water based poly by rustomleum over chalk paint this weekend on a sample door and the surface came out looking quite uneven finish wise. I applied a second coat and it was a little better. I was using a brush. Just wondering did you noticed any streakiness to the sheen on the cabinets? Also, did you use long brush strokes or apply to a small area at a time? Thanks! You can get brush strokes but I would apply and then go back very lightly, in long strokes, to even it out. You can also try a small sponge (for cabinets) roller to apply if you can’t get rid of the strokes. Hi, just wondering where to buy the annie sloan wax and paint? Wow your kitchen looks great! I’m doing some dressers in Annie Sloan now then would love to tackle my kitchen. Just curious how did you get such a smooth finish? Did you add water to the paint, and what did you use to apply foam roller or brush? Thanks so much! Adding water to the paint does help quite a bit. You could use a foam roller if you are worried about brush strokes. I used a Purdy brush. I don’t use rollers much anymore. 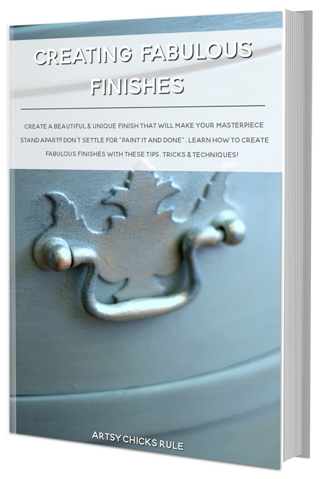 If you use a brush, you can lightly sand in between coats or at the final coat to smooth out the finish a bit before applying your finish/sealer. I love this! I want to do my cabinets and I was wondering how many cans you used for your project. Thanks for the inspiration! No that is a quart can. But I didn’t repaint the insides. Yep, just add a bit of water (not a lot!) You can pour some into another container if you like. Light even strokes (with a light hand). Plus to get a smoother finish you can apply one coat, let dry, then sand lightly with a very fine sandpaper. Then put on your second coat, and repeat. Then seal. We need to redo our cabinets again. We’ve tried 2 different things and failed at both. We would like a Pure White, though. Did the floor varnish yellow the pure white? If so, do you know of a product that won’t yellow it? Love the cabinets, but I have a question. After using the sealer can you go back over the cabinets with a dark wax (as) around the edges? Thanks! Yep, you sure can. I’ve used wax over poly several times for different reasons. BUT in the kitchen…I still probably wouldn’t. You could try a glaze instead. (mix some brown acrylic paint into the poly and apply, then wipe away so it stays in the corners/crevices) You can also use premixed glaze too. Thanks so much! :) Yes, I did still add a bit of Old White in to the mix. Pure White by itself was a bit too stark white for me. I think it ended up around 3/4 Pure to 1/4 Old. Make a tiny batch (using your measurements) and test. Then just make it the same ratio, just larger. Aw thanks so much Nicki! :) Good luck, I know it will be fabulous! I am thinking about doing the same thing in my kitchen that you did but was wondering about the sealant you used as opposed to the annie sloan wax. I have done a lot of research and have yet to find anyone that has used a different sealant with the chalk paint. It seems like it would make the process MUCH less time consuming than having to “wax on, wax off”. Please let me know how its holding up and if you would recommend the sealant you used or the wax. Thanks you and it turned out beautiful! I personally would never put wax in a kitchen. I think it might make me crazy trying to keep up with it and the constant buffing etc. I have a bread box that is waxed in the kitchen and I’ve already had to rewax it twice. It shows smears and gets dull but a quick buff fixes that but who has time for that? I am very happy with the sealant I used. :) It’s really just a personal preference though. Annie Sloan has a lacquer that she sells that can go over her paints too if you want to go that route. It’s a similar product and process as the sealant I used. Thanks much! Yellowing over time is always a problem with the polys. I will say though, that I’ve had minimal yellowing with this particular product. (some are better/worse than others) With that, I think you will always get a tinge of yellow over time. The water based are much better for staying true though. Oil based will yellow quite a bit. One way to help counteract that is to maybe paint them a bit more “white” in the beginning. :) Hope this helps! If you have any ideas how I can fix up my doors with a recess I would love to hear it. I am trying to do my 1/2 bath over and I am having no luck finding a vanity I like, figured the easiest way would to DIY mine. Thanks again! Love the cabinets! 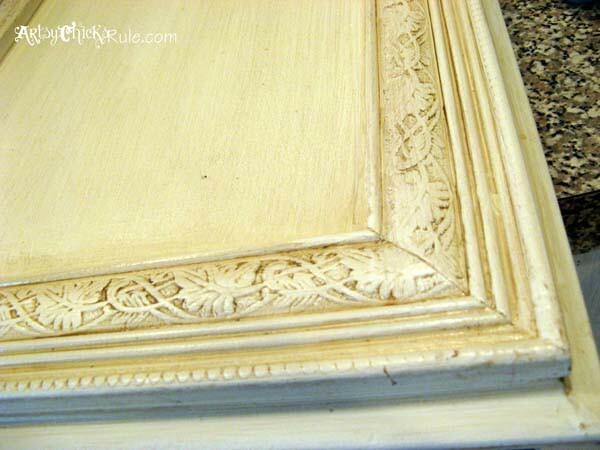 I’ve been researching wax/poly and probably will go with poly like you did to finish them after the chalk paint. Did the Varathane Floor Finish Polyurethane (from Lowe’s) have a strong smell??? (I know it says “no odor” but sometimes it still smells, and poly usually has strong odors). No it doesn’t have too much of a smell. BUT keep in mind, like you mentioned, it still has an odor. I am very sensitive to strong chemical types of odor and this one does not bother me much. what ratio of pure to old white did you use? I used approximately 3/4 Pure to 1/4 Old White. Somewhere in that range. Hope that helps! I would like to know about the paint u used. I am in the present time referbing my daughters bedroom. But I would like to paint them that white colour you have used ( what colour did u use please ) and I am a bit worried about the brush lines can u reassure me please. Yep, I sure did! Twice!! 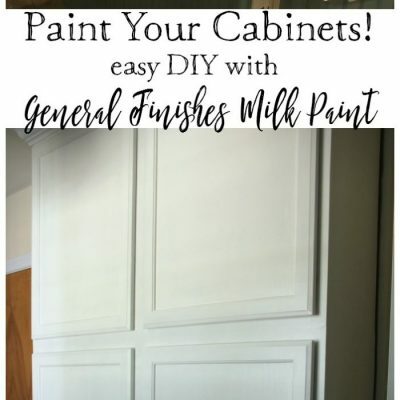 lol I am actually getting ready to try GF Milk Paint on my laundry cabinets. I love that paint too…we’ll see how it does! With that said, I am very happy with the CP in my kitchen. It’s been a couple years now and holding up great. I’ll come by and check out yours! 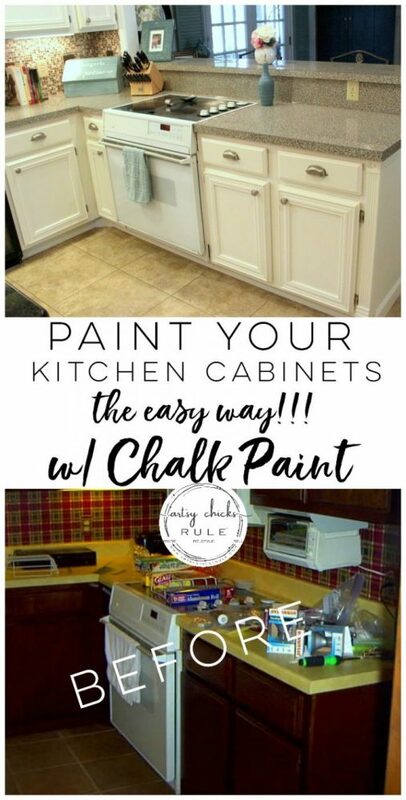 I would definitely paint my kitchen cabinets with chalk paint. I had originally thought I would use Old White, but after your experience, I think I would do just what you did. More Pure White, less Old White. 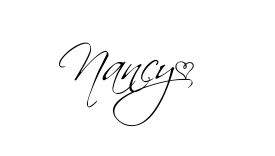 Hi Nancy,, just found your site. Just wondering on kitchen cabinets, what did you clean with first before painting? Thanks! I use ammonia mostly. Don’t use dish detergent because it can leave a residue behind. Hi Nancy, what a great site! It is such source of inspiration! I’m about to do my kitchen cabinets and I have two questions for you. My cabinets were professionally painted brick red about 10 years ago and now I’m thinking painting them Old Ochre–is that crazy? Do you think Annie Sloan in Old Ochre will cover it? Its a very dark red. Also, when you used the Poly Floor Finish, did you have to sand in between coats? I’ve read some people do. Again, great site and hope to continue getting more ideas from you! It will cover it but it may take a few coats to cover fully. Hi, love your projects! 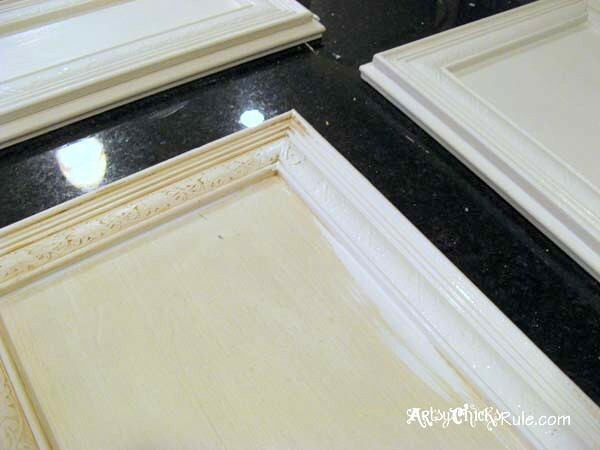 I am agonizing over what to use to seal my light maple kitchen cabinets that I am going to paint with white chalk paint. You have no yellowing on your white cabinets after using the varthane floor finish?? I want to pull the trigger so badly but I’m so afraid of yellowing. Thanks! Ok, it’s been several years now and it’s really hard for me to notice a change. BUT I would say they have yellowed a teeny, tiny bit. Not very noticeable to the eye. I only know because I painted something else with the same paint mix recently that I used on the cabinets and could see just a slight hint of change. I think it’s done pretty well actually! One way to combat that is to go all white. I mixed a bit of Old White in mine so they had a touch of warmth to begin with. To tell the truth, I’d still take that very slight bit of change over wax cabinets in the kitchen any day! Plus they will be easier to paint over in the future if not waxed. 2. do I need to shallac?? 4. poly like you used(do you apply and need to wipe off like the wax or just apply like a thin coat of paint? 5. glaze? what is that for? I thought the poly would have a slight shine?? If your cabinets are a dark wood you may need shellac. (bleed through) But shouldn’t need it otherwise. Yep, 2 coats should be fine. Poly, like the one I used, is applied like paint. Just brush it on slowly to avoid bubbles. I didn’t glaze mine. The original cabinet makeover, I used latex paint and glazed afterwards. This time I used Chalk Paint and applied poly. 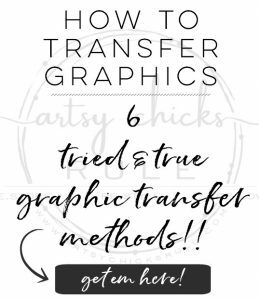 I would suggest trying out the whole process on a scrap piece of wood (or even a thrifted piece of furniture –cheap!) to get a feel for it and to see how it will be once done. You can use a cabinet roller for application of both if you are worried about brush marks. Love your kitchen! I am painting my kitchen table with your recommended combination of pure and old white. Would you recommend the Varathane on the tabletop for better durability vs. wax? Your help is amazing- thanks!! For the table top, I would recommend a light sand first, then paint, then something such as Varathane. Normally I wouldn’t worry about sanding first but for durability of a table top, I would. What an inspiring project. I’m trying to tackle my bathroom cabinets and kitchen cabinets and chalk paint is giving me a headache. I’ve light oak painted the bathroom cabinets black and now I’m putting on the poly that you suggested in semi gloss. It’s still a little chalky to the touch and when I touch it even a bit it leaves marks. That’s after one coat of poly. I tried lightly sanding before I put a 2nd coat of poly. I hoped for a smoother finish that doesn’t scruff easily. Also my kitchen cabinets are the same oak, and I’m painting those white, Now I’m on my second coat and it still shows through. Not happy :( I was hoping 2 coat will suffice. I’m using Valspar chalk paint though, maybe that’s why the coverage is not good. Black covered way faster. Now, I want to achieve a little more smooth texture, the chalky texture is a bit scary, how am I ever gonna be able to wipe those cabinets down. Now I’m scared!! Help! Should I have sanded between chalk paint coats? What if I used black latex over chalk paint, have you ever tried that? Thank you! Hmm, oak can be funny. Sadly, though, I have not used the Valspar Chalk Paint so can’t speak about it. I don’t know the properties of it. I don’t think it’s like the Annie Sloan that I use quite often. It does seem odd that they are still “chalky” even after the poly though. That has me baffled because it shouldn’t feel that way. You can get a very fine sandpaper and lightly rub over the paint to smooth it before you apply any more coats of poly. Try using a roller (made for cabinet painting) to apply the poly. You could probably use latex over that paint but again, I can’t say for sure since I haven’t used it before. I’m sorry, I’m probably not very much help! I had to go try the latex over chalk paint and boy am I happy with the results. Chalk paint (white) was just not covering fast enough, I would probably need 3 cans or more, so I decided to use it as a primer, so it’s still worth it to me, since I didn’t have to sand. I’m doing two coats of latex over chalk. I did varathane in the bathroom over black chalk paint and that looks great, too. I might try DIY chalk paint next time to save even more and use it as a primer. Thanks for the inspiration though, you gave me the idea to start painting, I didn’t want to do it before because it required sanding which I hate. And so glad you did it yourself! I am with you, sanding it not fun! Hi I am thinking about doing my kitchen. How many hours (about) did it take to paint all the cabinets? Did you take well to around the cabinet area? My kitchen is average size, island & such. I made my paint last time. I thought this would be better to purchase the paint for the cabinets in the kitchen. Do you have any feedback on the Anne Sloan brushes? I’m not really sure how long exactly (it’s been a few years) but I’m guessing it was a couple days total. (but I didn’t have to paint the insides since I had done that some years before) If the insides needed to be done as well it would have added some time onto the project. Just found you on pinterest and was wondering how the cabinets are holding up with the chalk paint? I am trying to decide about paint type, and sealer. Did the urethane eventually yellow most people say it does over time? Thanks in advance for the update. The cabinets (and island I also painted with ASCP in Duck Egg) is holding up great. I would do it again in a second. But I have gotten a teeny, tiny bit of yellowing. I only noticed it when I had to paint something (when we installed the sink) to match. For me, it isn’t enough to be bothersome, however. I’m sure you probably answered this somewhere in the comments -sorry to ask again. Do you think it’s necessary to sand down the dark original cupboards before using ASCP in a white color? No, I don’t think you need to do that if you are using ASCP. But keep in mind, it may take an extra coat to cover. If they have a shine, you could do a light sand (by hand) to remove a little of the shine. Otherwise, you should be good to go! Thanks so much for your advice but after reading more posts…I have more questions about my kitchen cabinet reno. I really appreciate your blog and your time. I just found you yesterday and the posts are extremely helpful. 1. What happens in the future if I use the Varathane floor sealer? 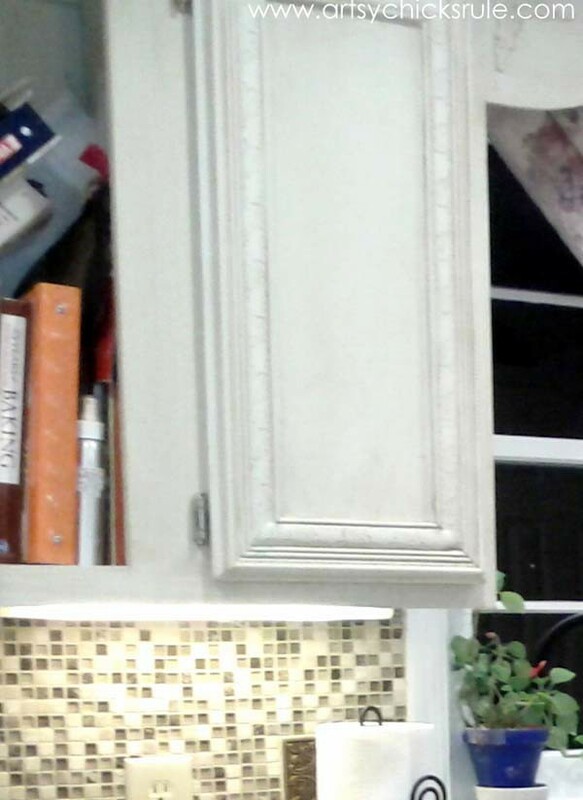 Can I paint over it if I decide to change the color of my cabinets again? 2. What happens if the sealer bubbles as I have read in other posts listed above you mentioned to sand them. But then what? Do you re-seal? Do you only seal a portion or the whole thing? 3. If I do use the sealer, what should I clean the cabinets with? I’ve used 409 or sometimes kitchen bleach spray depending on what I was trying to do. 4. On another project…I may do one of my pieces of furniture. What happens if I do the wax and don’t like it and decide to do sealer instead? How do I remove the wax? 1. Yes, you can paint over the Varathane. You would want to sand a bit beforehand though. 2. The sealer shouldn’t bubble. Don’t shake the can before applying and stir slowly as to not create bubbles. Also, use slow strokes when applying. If another coat is necessary for any reason, I would apply to the whole area not just a spot. 3. Anything that will cut the grease but not leave a residue behind. 4. If you use wax and then decide to do another sealer, you would have to sand down past the wax to apply it. It won’t adhere otherwise. I don’t recommend it as you’d have to end up repainting as well. 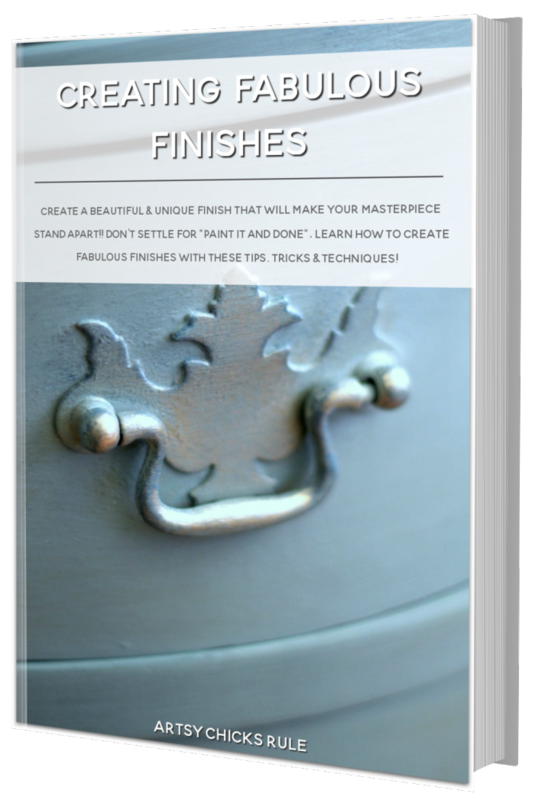 If you think you will want to repaint at a future time (with anything other than Chalk Paint, as Chalk Paint will adhere to the wax) then I would use a different sealer than wax. I’ve been wanting to paint my honey oak kitchen white since we moved in 2.5 years ago. But i haven’t got the nerve to do it yet because I’ve read sooo many blogs on how to and it seems so daunting. I found yours today and found it simple and heartening! Im worried about the white not yellowing because of the poly and it being strong enough to ward off knicks, stains, washing. I really liked your idea of the waterbased polyurethane floor finish so it’s really durable. So…long story short….it’s been a couple years since you posted this, how have they held up? With the ascp should i sand the cupboards first or can i truly skip that step with the chalk paint? I think anytime you use any poly (if if they claim to not yellow) you do have a chance of at least a little yellowing. I would take that any day over using wax in a kitchen. Yes, the Varathane is pretty durable. I haven’t had any trouble with chipping, etc. It’s held up really well. How did your husband build the filler pull out beside the fridge. We are currently trying do that beside our sink and it’s throwing us a little cause we have a 6 inch opening we have to fill. Yep, that will be perfect for something like this! I don’t have plans for it however. We built it before I started the blog so didn’t take pictures, etc, along the way. It’s pretty basic though! I can ask him and if there is anything that jumps out that you may need to know about it I will let you know. Sorry I can’t be of more help with that! Please do that would help us tremendously! Hi Nancy- I love your kitchen! I am in the same boat you were. Painted and glazed my cabinets 6 years ago and I just think they look dingy now. Want to paint them white. When I painted them I sanded primed and put on three coats of polycrilic to seal. They have held up very well. No chips anywhere so I’m happy about that but it was a huge job and I don’t want to go through all that work again! My question is – with three coats of poly on them – do you think I would have to sand? I noticed you did not sand when you repainted after putting on the floor varnish. Are they holding up ok now? Also- I noticed you said you are going to try a different paint for your laundry room. Have you done that yet and if so- what paint did you choose and do you like it better than the chalk paint? And yep, mine are holding up great all these years later. AND, I’m trying to use and test out a few new paints so I can do a comparison/pros/cons post for my readers. Hoping to have that done this Fall! I would distress before you add the final finish coat. Since distressing sands away some of the finish and paint, it will leave it a bit vulnerable. I would seal after. Oil based poly is notorious for turning yellow. The Varathane did yellow a slight bit but not nearly as much as an oil based poly would have. Plus, it did take a few years to get that way. I am actually going to be repainting the kitchen in white-white soon. I’ll be posting about it on the blog as well as updating this post. Yes, the Varathane is solid, they have held up wonderfully. No chipping or wear of any kind. Except for the slight yellowing, they look just like they did the day I painted them almost 4 years ago. Yep, Lowe’s. 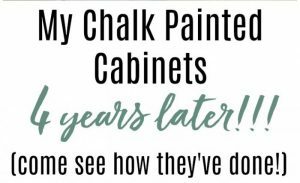 Thank you so much for answering about how your painted cabinets have held up over time, even though this post is from years ago! We just bought a set of cabinets to re-do our kitchen (for $500 for the whole kitchen!). They are celing height and are beautiful in their proportions, solid maple door/drawer fronts, but they are painted in a light buttery yellow, so they need a new coat of paint. I was feeling stressed about painting and installing cabinets, but I think I could handle the process if I don’t have to sand, sand, sand… I think I’ll go with Pure White ASCP. I can’t thank you enough for taking the time to share this post and for answering everyone’s questions. I read every comment! Wow! The after turned out great! The cabinets don’t look anywhere near their age! You do such an amazing job..:) I just recently started chalk painting. I have painted my old dining table, but have not sealed it yet. Would this sealer be good for dining table or is there another one that i can use? I don’t want something that can be harmful to my family since we will be using it on a daily basis. I’m about to dive in and paint my cabinets. I just don’t trust that the wax will hold up so I’m going with the poly you used. How did you apply the poly? Brush or sprayer? Thanks! Looking for easy yet effective! Nancy…I have copied and pasted this entire article of yours here. I am planning on using Annie Sloan’s Chalk Paint to paint my kitchen cabinets too. My cabinets are so plain and I love how you enhanced yours. Can you tell me how you did that? Thank you for getting back to me. I will keep checking your site for your full tutorial. Beautiful cabinets. Please tell me, what about brush strokes? I am not seeing any in your pictures. We painted our cabinets 3 years ago with a normal latex paint. They’ve held up decently well but regret the color choice so much!! I’ve toyed with the idea of using chalk paint on them several times but I’m very nervous about it not adhering to the existing paint or looking terribly thick.. do you have any suggestions? 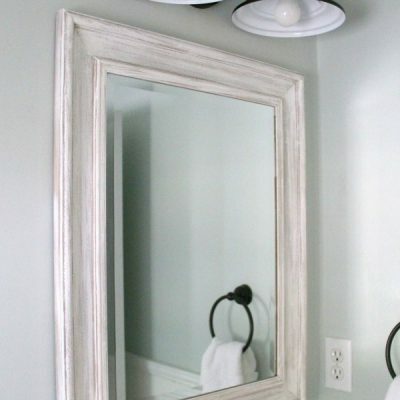 What do you think of Rust-Oleum chalk paint on bathroom cabinets rather than Annie Sloan? Also I used polycrylic on my red island cabinets to seal and it came out horrible! It is now chipping and flaking- we stained and then used glaze followed by the polycrylic. It was more then likely user error but I’m not sure what I did wrong- my question is have you ever experienced that with the Poly you used? Also do you have a favorite cabinet cleaner you like to use?